One of the smallest and rarest types of Anubias in the world, Anubias nana “Pangolino” is a fabulous addition to any underwater landscape. It needs a bit more light to grow compact foliage, but otherwise it’s just as hardy as the standard Anubias plant. Anubias has a natural look when anchored to roots or driftwood. No pest infestations or pathogens arise with Dennerle In Vitro plants because they are cultivated and packed under sterile conditions. Each cutting is also free of algae and snails. Unlike some aquarium plants available, Dennerle plants come in a culture cup with the leaves emmersed, so they don’t need to be acclimated. 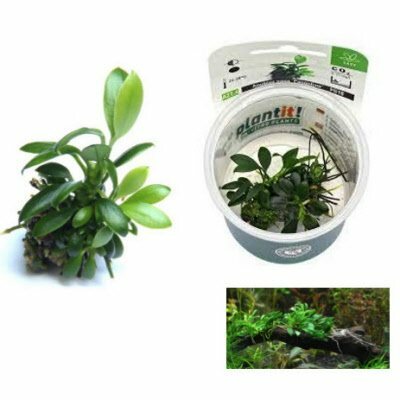 This means that you can place your new plant directly into your aquascape and it will grow uninterrupted. Note: You will receive ONE Anubias plant with this order.